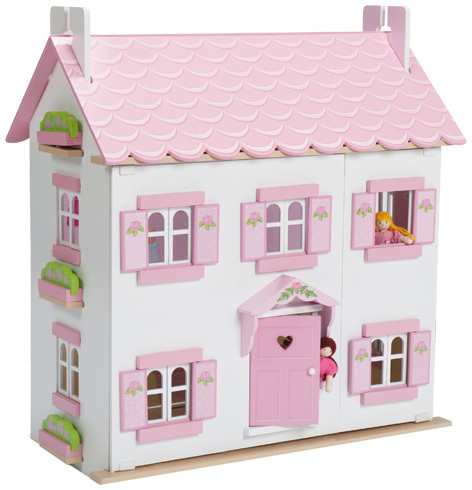 Sophie's House is one of the most popular Le Toy Van dolls houses for girls aged 3 and over. The classic fully painted styling makes it instantly appealing to all little girls who love collecting the furniture and figures to put inside. Comprising two floors and a roof space, the front doors hinge open and both roof panels can be removed for easy access to all parts of the building. Their unique designs and trademark attention to detail has led Le Toy Van to become one of the world’s premier painted wooden toy manufacturers. Their ranges not only include dolls houses but also farm buildings, castles and pirate themes. Kids also love the fabric and wood Budkins characters that also have their very own buildings to play in. Please tell us what you think of Sophie's House by Le Toy Van. Exceptional value for money and my daughter loves it. We were so happy to receive this stunning dolls house last weekend. My daughter has been so happy playing with the pets and all the other little accessories that she got with the house. Her friends from play school are a little jealous and would really recommend this house. A solid toy with lots of play value!